BJ Fogg, Founder and Director of the Persuasive Technology Lab of Stanford University, described his persuasive behavior model via a bathroom epiphany scenario during MarketingProfs Digital Marketing Mixer in Chicago, Oct. 21-22, 2009. Definitely an appropriate and fascinating addition to Bathroom Blogfest 09! BJ's keynote was titled Design For Change: Why Facebook & Twitter are Winning. He shared his research into how computers affect persuasion [i.e., captology], with particular focus on persuasive social networks like Facebook. Intrigued? You should be as his presentation gets to the heart of how we increasingly communicate using the technology platforms available and try to generate behavior changes - i.e., persuade others to take an action - that benefit us/our brand/our products and/or services. It also puts into better perspective offline persuasion. Imagine this bathroom scenario: BJ Fogg faces himself in the mirror and doesn't like what he sees. That vision motivates him to seek out "hope in a bottle" [i.e., Olay Regenerist], which requires a behavior change [dutiful application]. A missed trigger, though, prevents an application. The only way to amend the oversight is by placing the trigger in BJ's path so he can't miss it. Triggers come in two forms: hot or cold. We should aspire to HOT triggers as they allow you to take action now [e.g., pick up a free copy, just roasted coffee from EAT on Swallow Street, buy tickets here]. A cold trigger on the other hand enables no immediate action [think a print ad or radio spot call to action; you must do several something elses before taking action]. Cold triggers have become cheap and unimportant. Particularly effective is combining a hot trigger with a facilitator [e.g., save the box so you can take your designer hotel soap home]. BJ urges the lightest touch of motivation that works [e.g., think of the subtlety of eBay or LinkedIn]. Also, once the motivation identified, you can focus on the triggers and facilitators. Ability is critical. If the person whose behavior you are trying to change cannot do what you ask him/her to do, you will not effect change. You must also increase that ability by simplifying rather than through training. 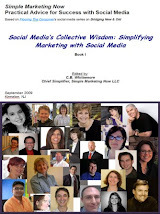 For example: Twitter is popular because it is so easy to use; it requires no training. Simplicity - defined by 6 factors that change depending on the individual and the context - makes it easier for people to take on a new behavior. The 6 simplicity factors include: time, money, physical effort, brain cycles, social deviance and non-routine. BJ's Behavior Model section on ability includes a 12 minute video explaining his simplicity framework from which I learned that simplicity is a function of the scarcest resource at that moment [e.g., if I am time-crunched, don't make me jump through intellectual hoops to take action] and that expectations play a key role in the perception of simplicity. Applying all of this to Facebook which BJ Fogg considers extremely effective in triggering persuasion [hence the successful Stanford Facebook Class], consider the many Facebook triggers you receive notice of via email [photo tagging, comment strings,...], the status update ritual, the reflexes [comment, like, etc.]. Facebook has created rituals around these triggers, making it easy to take on new behaviors. As I digest this framework for behavior and persuasion, I can't help but think through examples of hot not-to-be-missed triggers combined with motivation level and ability to take on a certain action. It has me reconsidering my off- and on-line actions and appreciating the truly simple and effective ones that persuade me to change behavior. What about you? What do you think? How do you see implementing persuasion in what you do? 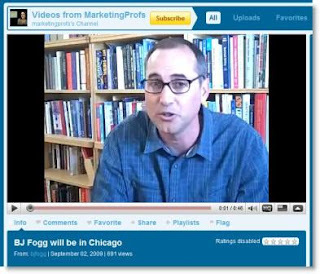 Here is the .47s MarketingProfs video of BJ Fogg Will Be In Chicago and the social media release on the event. Mack Collier's Recap of the Digital Marketing Mixer includes a section on BJ Fogg's presentation. Great post. I've added it to my favorites so I can come back to it. After BJ's presentation, I decided to revisit all of my marketing to make sure that I have the right persuasion at the right time. It doesn't matter how well we do anything there is always room for improvement. Thank you for summary and links.